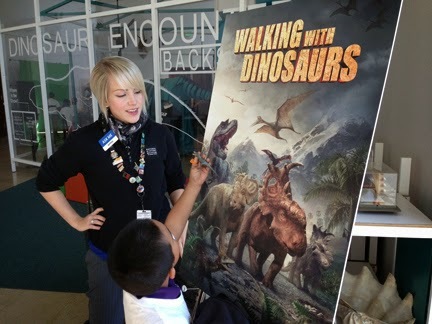 MOMMY BLOG EXPERT: Walking With Dinosaurs Movie Review & Red Carpet Event at Natural History Museum of L.A. 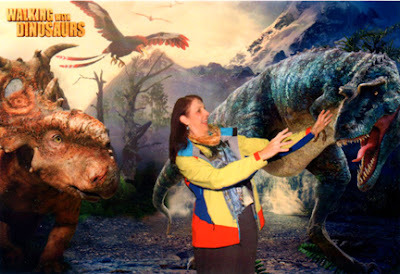 Walking With Dinosaurs Movie Review & Red Carpet Event at Natural History Museum of L.A. 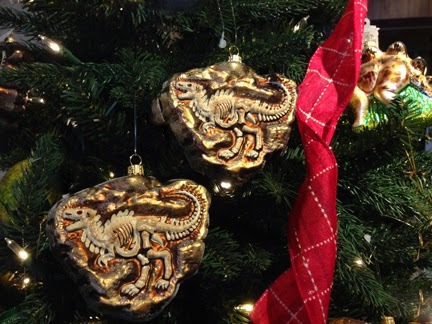 Walking With Dinosaurs 3D, from 20th Century Fox, stomped loudly into theaters and across the big screen this weekend nationwide just ahead of the Christmas holiday. This family-friendly movie is the story of another underdog animated creature -- in this case a dino named Patch -- morphing into a hero and saving the day. 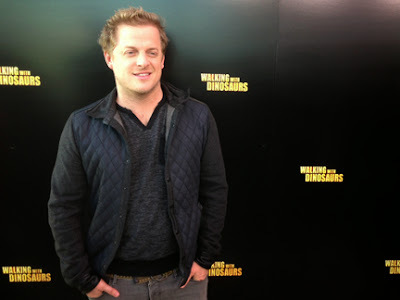 What fun it was to attend the film's Walking with Dinosaurs Red Carpet event at the Natural History Museum of Los Angeles just over a week ago, ahead of the theatrical release on December 20th. 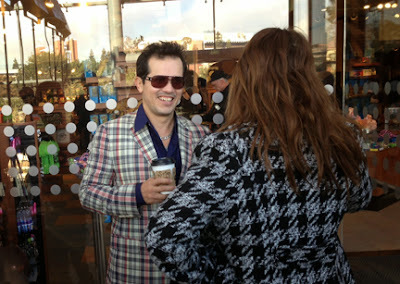 On hand for interviews and photos were voice actors John Leguizamo (Alex), Tiya Sircar (Juniper) and Skyler Stone (Scowler). 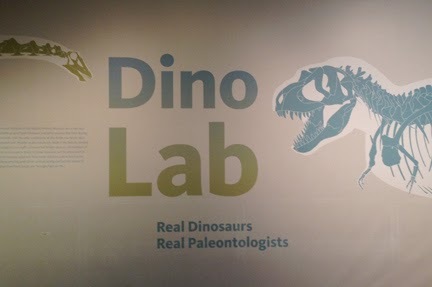 The morning's activities not only included a self-tour of this world class museum's dinosaur collection, but also a demonstration of AppShaker Augmented Reality where kids had the chance to watch themselves interact with the dinosaurs from the movie on a large screen. 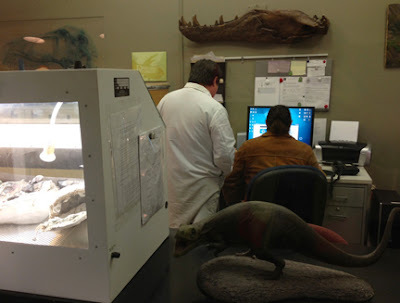 Upstairs, youngsters had the opportunity to be role play as paleontologists by digging in sand boxes for treasures. They also got to view actual dinosaur scientists at work with real specimens in the Museum's glassed-in lab. Rounding out the dinosaur activites was a green screen photo op with dinos from the movie as a backdrop for a group of 200 school children invited to participate along with us grown up press members. 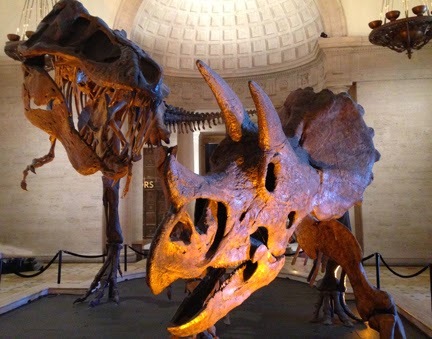 According to the movie's official site, "Walking with Dinosaurs is the first time in movie history audiences will truly see and feel what it was like when dinosaurs ruled the Earth." The animated action film, made with an $80,000,000 budget, has a runtime of 87 minutes and is rated PG for some scary scenes. As a parent myself, I'd suggest you use your own judgement as to whether or not this is going to be too realistic and terrifying for your child. 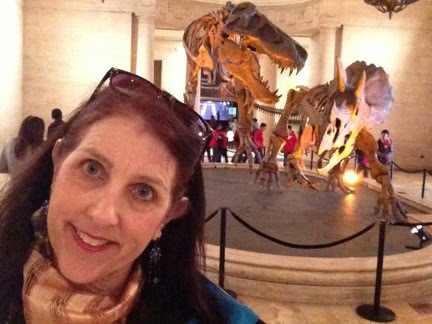 You can learn more about this film now in theaters on the official website WalkingWithDinosaurs.com. There you'll also discover engaging activities for kids to get to know the movie's main characters and more free and educational activities for children and teachers. FTC Disclosure: I attended the Walking With Dinosaurs Red Carpet and Natural History Museum of Los Angeles as a guest of 20th Century Fox. However, opinions and thoughts are my own. See complete FTC Disclosure information that appears at the bottom of MommyBlogExpert's main page and at the bottom of every individual post on this blog, including this one.